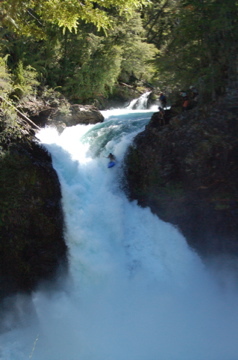 Max Blackburn running Salto de Alerces on the Rio Manso Argentina.The Rio Manso about 300 km south of Bariloche is located within Los Alerces National park. You have to pay to enter the park during the day. Park Rangers leave around 5 pm, after which you can sneak by. Pay camping and free camping within the park. No fires, only in pay camping areas. Don’t tell anyone you are running the falls or the river, unless you have permission. Shuttle is a mission. Take out for the Manso Gorge requires a 6 km lake paddle out on lake Steffan. The shuttle takes about 3-4 hours to drive. 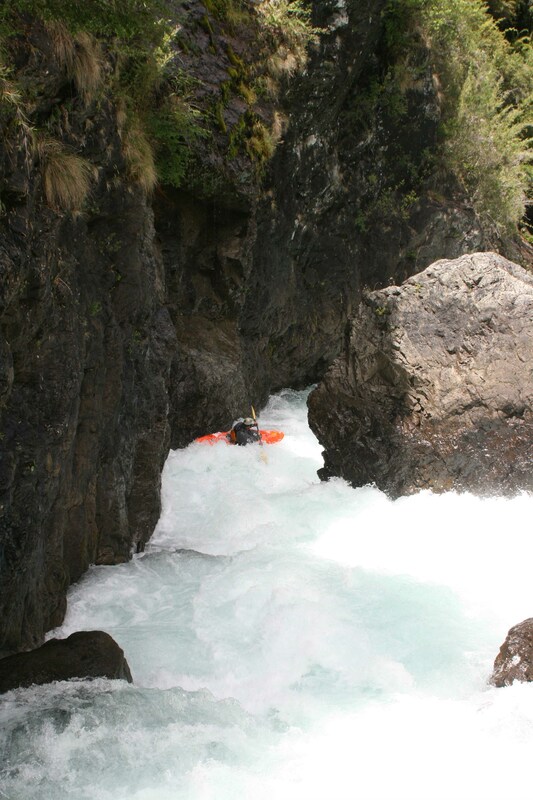 Dave Fusilli running the other option at Salto de Alerces, known as the slide in the river left channel.Here are a few photos of the Manso Gorge section below Salto de Alerces. 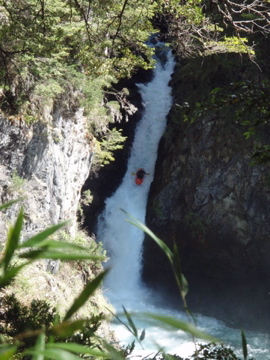 This is a shot of the 3rd drop in the gorge below Alerces.big drop-manso gorgeThis drop was 1st descented this year (February 2008) a few weeks after this picture was taken. There is a river wide ledge hole before this waterfall, that is normally considered a portage, but is runnable. The river necks down to about 15 feet wide with vertical walls on either side. 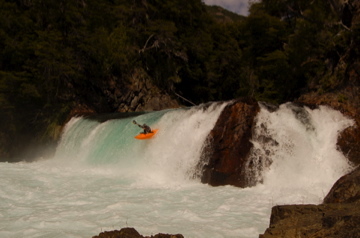 Portage on the left for the big falls as well.manso.jpgThis is a rapid in the gorge below the big falls.The last time we tried to run the gorge we were turned away by park rangers who informed us we needed permission from the park office in Bariloche. We did the run a few weeks before at higher water and had no run ins with park rangers. The Salto de Alerces is illegal to run. Great river if you feel like huckin your meat, otherwise…its really pretty.